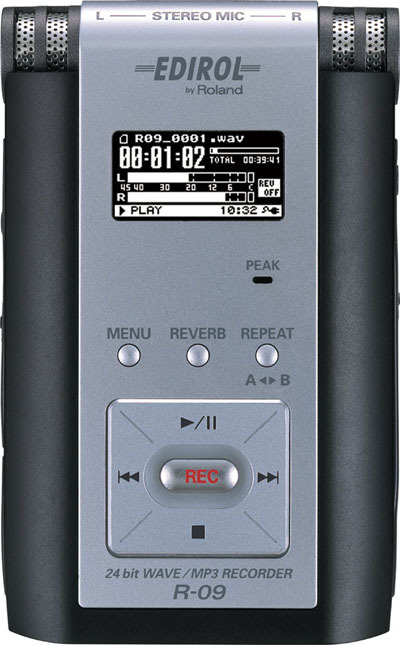 The Edirol R-09 is a handy field recorder with some surprisingly sophisticated file-maintenance features. It is profoundly easy to use (once you suss out the buttons), it records to inexpensive media, and the onboard mics do a decent job. Battery life is outstanding. It looks cool, too … It’s not for everyone. Professionals will want higher sample rates, enhanced metering, and more robust mics. But they’ll have to pay a lot more. Still, if you’re willing to spend in the neighborhood of four hundred bucks, you can make NPR-quality recordings for podcasts or radio shows, or quality concert bootlegs. Not bad for a gadget that fits in a shirt pocket. It’s tiny (smaller than a microcassette – see below) and records 24 bit digital audio with a sound quality that surprised me in a good way. It’s light even with batteries and should easily fit in a shirt or pants pocket. The only gripe I have so far, and it’s been mentioned on the net via group lists and the like, is the battery cover. The cover, located at the bottom of the device is very hard to deal with and seems like it’s going to break long before anything on the rest of the unit. Additional good news is both mic/line R-09 inputs have tested adequately quiet and of sufficient bandwidth for at least 16bit depth recording requirements. However, audible improvement for 24 bit depth recording is likely with the addition of high quality external mic preamplifier for lowest noise/distortion requirements. DAT-Heads Edirol/Marantz/M-Audio comparison: The one tricky bit to sort out is the age-old “which recorder should I buy” question, particularly with M-Audio’s competing MicroTrack posessing such a similar feature set. Stephen Bezruchka, one of the portable recording gurus on the DAT-Heads mailing list, takes his R-09 head-to-head with the MicroTrack and Marantz PMD-660. His major beef with the MicroTrack is poor reliability (in his experience) and the inability to replace the battery yourself; the latter issue sounds like a deal-killer for many, especially since the MicroTrack’s higher digital recording sample rates aren’t really critical in this kind of device. The Roland R-09 is compact, featured, easy to use and may become the one I use the most. It is becoming accessorized to get with the iPod mania, so there is a carrying case with a tripod on the way as well as a microphone stand adaptor to put the unit in its case on a stand to use it as a complete microphone-recorder combo. 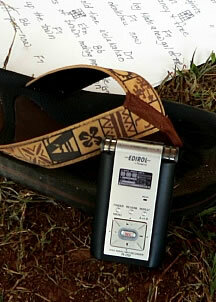 We are blessed with good recorders to choose from. For more reader reviews, ranging from the informal three-line response to an extensive list of pros and cons, see the 55 comments on the original R-09 story. Reliability is an issue on all of these devices, presumably because of the size and some readers being early-adopters. Edirol seems to have the best track record, though, both in terms of reliability and speedy replacements, and has the added advantage of being able to replace the battery yourself if there’s a problem (something you can’t do, notably, on Apple’s iPod line). One important note: be very careful when buying memory cards. My current preferred brand is SanDisk; their cards have been extremely reliable and are available at some still-fantastic bargain prices. Some readers have complained about a slight hiss when recording low levels. This seems to be related to the internal mic, so your best bet is to plug in a better external mic. Thanks to everyone who sent in that barrage of tips, questions, and comments. Keep them coming, on this and other products you care about! Bob Dylan Art: Opening Up a Big Jar o’ Stature-Free CDs!